If the title of today’s blog captures your imagination enough to read it, I think you’ll be happy you did. I’ll be revealing two secrets–one is about of living a Great Life and the other is about the role of Chocolate while living a Great Life. First, there’s a short YouTube Clip with a cleverly delivered message about how to develop the right personal philosophy to live a Great Life. 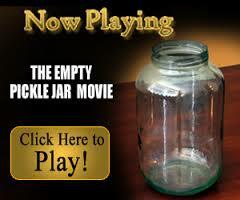 The YouTube clip uses a Pickle Jar to deliver the message. I know, it’s hard to imagine, but it’s effective and memorable. After you’ve watched the clip, you’ll discover the connection to the second secret revealed this blog. I actually delayed preparing and sending todays offering until I had the time this weekend to dig through my Recipe Collection to find my all-time favorite, incredibly easy Chocolate Trifle recipe. Some of you may not know what a Trifle is, so stayed tuned. Last week, I received the YouTube clip from one of my work colleagues. 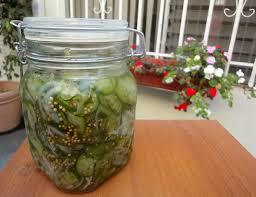 She was so impressed by the message, it’s delivery and the analogy created using a Pickle Jar that she just had to send it along to the people she cares about. After watching it, I too was impressed. It’s simplicity and clever approach to deliver an important message was the clincher that made me want to share it in the blog. Check it out. It won’t take long to watch, but I promise it will stay with you for a long time. Be sure to watch all the way to the end, because it will only be then you’ll discover why the second part of this blog is here. Well, the following recipe is easy, easy, easy to prepare, AND it lends itself to personal creativity so you can make it your own. I can honestly say I have never presented this recipe exactly the same way twice. BUT according to my guests, every presentation has been Impressive. 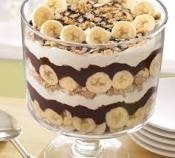 I highly recommend using a Trifle bowl or a special clear glass bowl in which to layer the ingredients. 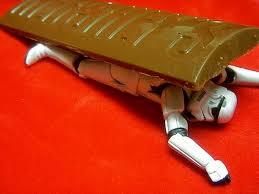 I’ve borrowed some photos from the internet to stimulate your imagination. I want to tell you the recipe is not some evolved family secret. I remembered various forms of this recipe having been around since Instant Jello Pudding became available at the local grocer. I checked it out on Google, and the basic recipe for this Trifle is easily found. BUT, no one just prepares the basic recipe–everyone want’s to use their imagination to create their own version of it. But regardless of the version, there’s layer-after-layer of rich, moist chocolate cake, the crunch of your favorite caramel candy or cookie, the crisp sparkle that comes from the fruit, all of it merged by the lushness of the whipped cream topping. This is truly a great dessert. Try it! 6 Skor candy bars or 6 Heath candy bars, chilled and chopped or about a dozen Oreo Cookies or other favorite cookie, rough chopped. 1. Prepare cake mix as directed, or make your own chocolate cake recipe and bake in a 9 x 13 inch pan. 2. When done, remove from the oven, and poke holes in the cake with a fork and pour the Kahlua (or coffee mix alternative) over the cake. 4. Meanwhile prepare the pudding or mousse; refrigerate to cool. 5. Prepare candy topping by breaking or chopping toffee bars into small pieces with a hammer or sharp knife. Doing this step while the candy is still in the wrapper or in a Zip-lock bag makes this a less messy process. If using the Oreo or other cookies, break them into small pieces. 6. Cut, tear or crumble the cake into large bite size or bigger pieces. 7. 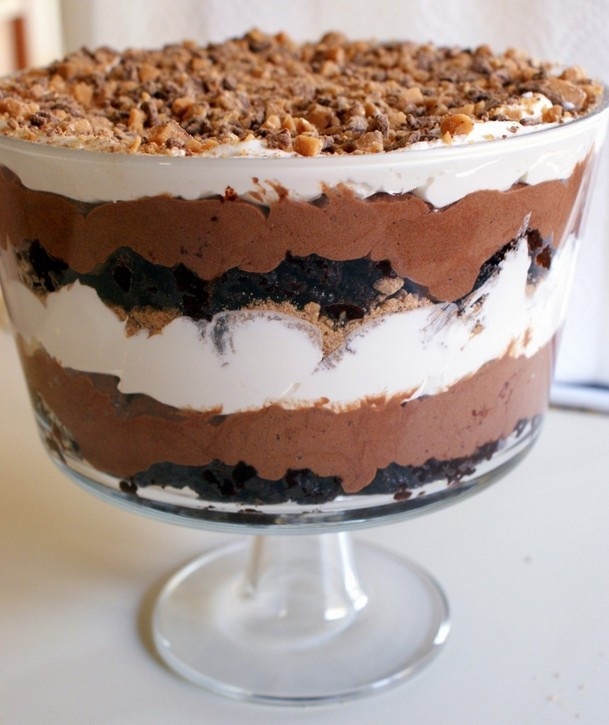 In a glass trifle (or other special clear glass) bowl begin to layer the ingredients in the following order: 1/3 cake, 1/3 pudding, 1/3 whipped topping and 1/3 candy bars or cookies. 8. Repeat layers ending with chopped candy bars on top. 10. When ready to serve, place raspberries, strawberries or banana around the outside edge of the trifle and then garnish with mint leaves or edible flowers. 1. Substitute any Chocolate Cake mix or you can even try a cake-like brownie mix for an even richer and luxurious texture and experience. 2. Don’t hesitate to make this your own special dessert by using different cookies, candy, fruit, layer variations and toppings. 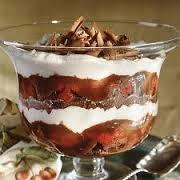 Google Chocolate Cake Trifles, and you’ll find more than enough photos to inspire your imagination. What a wonderful article and I’m going to try this recipe soon…maybe even for Mother’s Day this upcoming weekend!